I am so thrilled to share this holiday collaboration with you all! First of all, let me mention that Lush was an absolute DREAM to work with! They were incredibly generous and kind and made this entire experience effortless and fun. I have loved their store for a long time and always find a great selection of affordable, stylish items in there! I have used Lush exclusively the past 2 years for my holiday party outfits because they have such a wonderful selection of festive things for any body type at much more reasonable prices than other boutiques or department stores. Their Moments to Midnight collection is chock-full of beautiful goodies! Let's talk specifically about what I chose this year. For my Christmas party outfit, I went with this trendy red bodysuit with a puff sleeve and these black trousers. This was actually my first time trying on a bodysuit, and I was surprised by how much I loved it! It created such a sleek look that wouldn't have been possible with a different type of shirt. The trousers fit like a dream, and I love that I can also style them for work-wear once the holidays are over! I completed the look with a strappy black heel (only $29!) and a statement necklace. 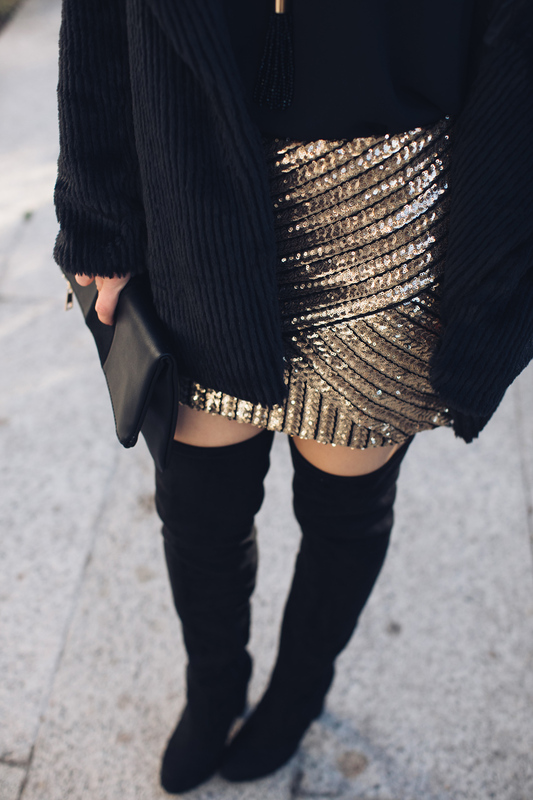 My New Years party choice of course included some sparkle! I fell in love with this skirt as soon as I put it on. This particular skirt is out of stock online so I have linked a similar one here, but it is available in store. You can also call to order from the store if you aren't local! I was very impressed with how warm and cozy this coat was- it is a definite must for fancier outfits in the winter. I have already played with styling it for more casual outfits as well (posts to come this week!). I can't get enough of the over-the-knee boot trend this season and think they're the perfect addition to a short dress or skirt this winter! Be sure to check Lush out for all your holiday party needs as well as adorable gift ideas for your friends and family!